Being a painter of traditional styles, Marian's inclination led her to concentrate her new interest into creating artistic pieces that could be hung on a wall. 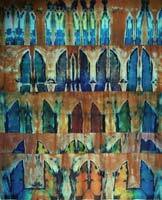 And so for the next 10 years her focus would be on dyeing wall panels to frame or hang. 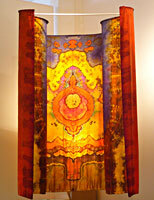 Over this period her techniques were constantly developing from relatively basic shibori, or tie-dye and stitch resist, and finally into clamp resist methods, and three dimensional structures. As mentioned earlier, her skills fitted into the textile revival of the 1960s and she was quickly recognized for her beautiful fabrics. After a few years of living in Australia Marian and her husband were eager to see more of the world, so the family decided upon emigration to the USA. Roger went ahead to find work and a home and the family followed 6 weeks later. For the first 2 years they rented a house in Cupertino, California. That was before it became world famous as the home of Apple Computer. Marian continued her craft working from the kitchen and, because the flower children in San Francisco had brought a new interest in colored textiles, her textiles were soon in demand. Although technically related to the popular textile tie-dyeing of the times, the complexity and sophistication of her work made it stand out and she became a leader in this textile renaissance. She sold through galleries, first in San Francisco and eventually in Los Angeles and New York, and in addition to the private buyers her work was installed in several corporate offices and public buildings. At the same time one big event would take her in another direction. While watching a stage performance at Stanford University she thought the artistic director might be interested in her fabrics. She asked to meet her and showed her some textile pieces. The art director, who was Nancy Potts, told Marian that she was working on new musical called “Hair” and she thought the fabrics would be ideal. And so Marian was awarded contracts for textiles to be used for garments and ceremonial cloths in 9 different productions of the rock musical. This would be the beginning of Marian's transition from wall art to theater, garments, and finally fashion. In 1970 the family bought their first house in the hills close to the small town of Los Gatos, and this would provide a significant benefit to her working environment. The house contained a two car garage which could be converted. Fortunately Marian's skills had already been recognized and so with aid from a National Endowment for the Arts grant, Marian soon had a dedicated workshop complete with deep sinks, stovetop and large dye-pots, plus a design and finishing area with a large table. The family lived in the south Bay Area which was about 50 miles from the centers of the fiber art scene in San Francisco and Berkeley. Although not a long distance to travel, having to care for a young family restricted Marian from participating in most group activities. 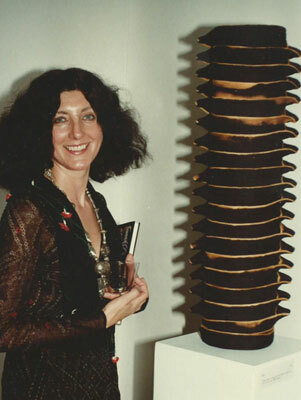 Even so her work was soon known nationally and in 1972 it was selected for the milestone exhibit of modern textile art, “Fabric Vibrations”, at the Museum of Contemporary Crafts in New York (now called the Museum of Art & Design). This was followed in 1974 by “The First world Crafts Show” in Toronto, Canada. In the following decade she would participate in nine major invitational exhibitions across the United States and in Canada, England, Japan and Poland. 19 international invitationals and six solo shows followed, introducing her work to additional audiences in Chile, France, Germany, India and more cities in Japan and the US. In 1975, prior to the 1979 revolution, husband Roger was offered a job in Iran and the family took off for a year and a bit to live in Tehran. This was a new experience artistically and, although she studied the local art, she didn't find it too connected with her own work. What she did discover was during visits to the bazaars. There she found unique materials that would add new dimensions to her designs, in particular donkey straps that were used to secure the load to a pack animal. And so began a new phase of dyeing and weaving with webbing and ropes. With her silk and cotton textiles Marian had created a few 3-dimensional pieces such as tents and her ceremonial enclosures, but these new materials would lend themselves to many varied forms. In fact, on her return to the USA Marian continued her search for suitable “industrial” materials. One discovery, cotton roving, would become a major feature in large works. She would dye the roving and then knit it or spin it into ropes. Rope making was a very primitive manual task, with the individually dyed plies tied to a tree on the far side of the lawn and spun with a manual crank made by her husband. Life continued to be an adventure for Marian. Through the 1970s Marian's work gained more and more acclaim, and she was included in many major invitational exhibitions as well as one-man shows across the USA and internationally. A list of important shows, along with major publications that included her work, can be found in Appendix.